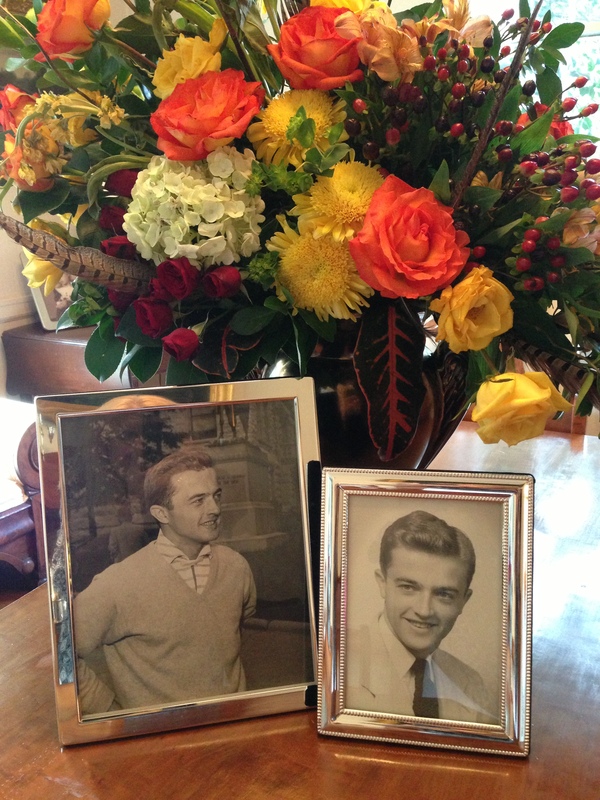 Over the last six weeks, I’ve given a lot of thought to what made my father so special. Unique. Speaking with friends and family who knew him well, I think I’m getting closer to defining it. It’s something like this: he was self-assured in a way that made those around him feel better. He had a quiet confidence that was the furthest thing from arrogance. Daddy never bragged. He tended not to speak at length about anything, least of all himself, and he had little patience with those who do. 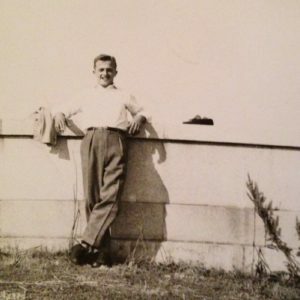 One friend expressed it this way: he said my father had a sort of grace. And that’s it. 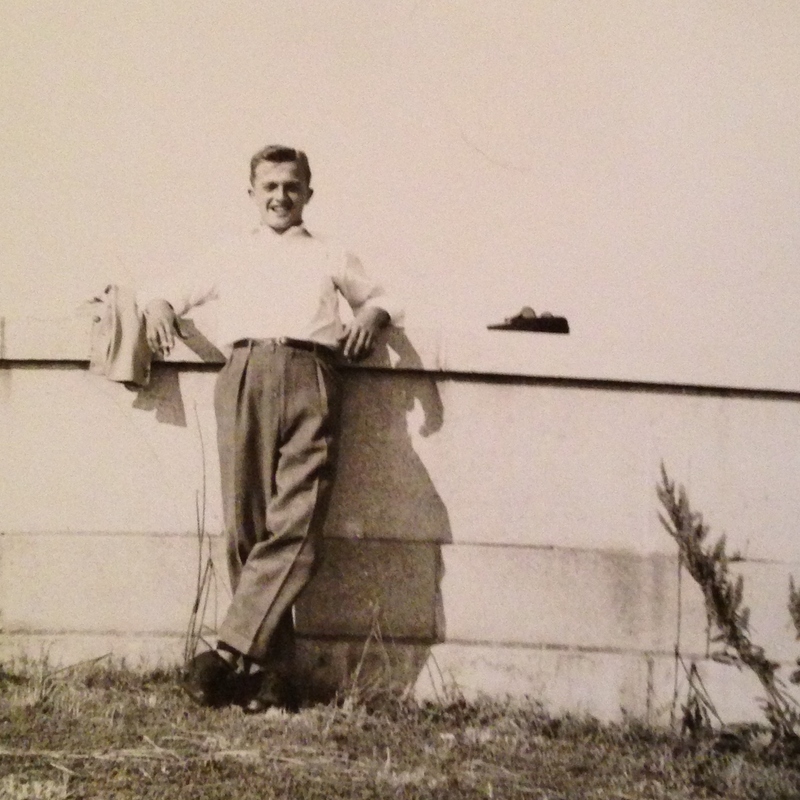 Daddy had an unassuming, infectious charisma. An easygoing demeanor that told you, maybe even without a word: Hey, everything’s cool. No need to worry. His assurance reassured you, built you up and improved your outlook. Even during that final week, after his stroke, while he was leaving this life little by little, Daddy’s presence was uplifting and reassuring. 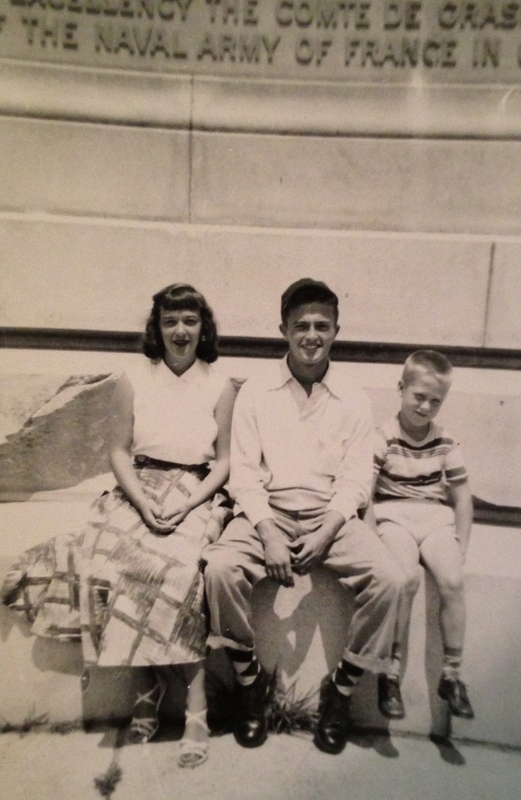 Daddy with his mother and younger brother on vacation in Florida, 1953. My father looked on the sunny side, and when you were with him, you basked in the sun, as well. 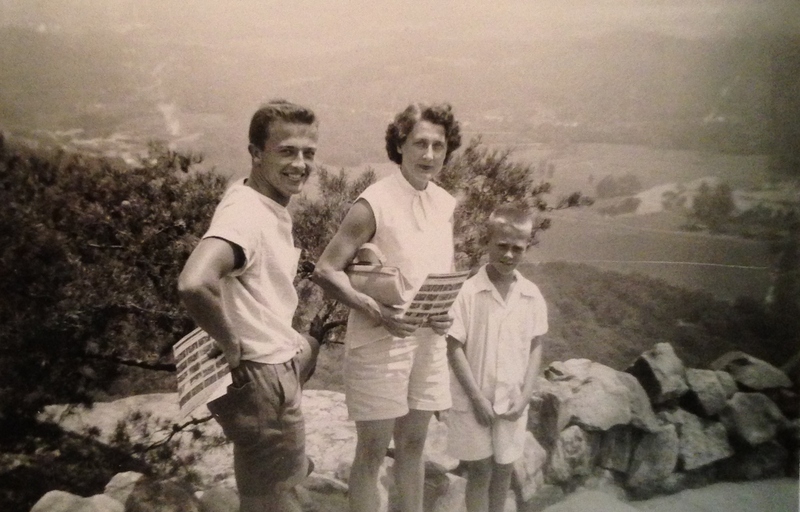 That, plus his incredible good looks, must have been what drew Mama toward him over sixty years ago. My mother tends to see the shadows. She’s a worrier. She’s acquainted with melancholy. Daddy was, in so many ways, her sunshine. Daddy with his sister and younger brother, again in Florida, 1953. One of my more vivid childhood memories is being at the Garden Hills pool with Daddy when I was little. We’d go swimming sometimes on summer Saturdays, just he and I. I hated getting into cold water. Still do. My daughter makes fun of me every year at Cape Cod as I stand wincing, dipping one toe into the bay. As a little girl, I’d wrap myself around Daddy like a monkey, and he’d get in at the shallow end and gradually wade deeper and deeper. At first I’d be shivering like crazy. But his warmth and sense of calm would soon spread to me. I’d take a deep breath and relax. The shivers would disappear. Daddy’s sunny grace would shine on me, and I could play in the water all day. I never had any doubt that with Daddy, the cold water would turn into something wonderful and fun. And I’ve never had any doubt about Daddy’s love for me. His most significant gift has been, and will always be, the absolute, unwavering certainty of his love. No matter what, he was my champion, my loyal defender. He was partial, of course. But he was also generous with his love, not just to me but to all his family and friends. If he loved you, he was in your corner. Resolutely. Enthusiastically. And you knew it. Never questioned it. 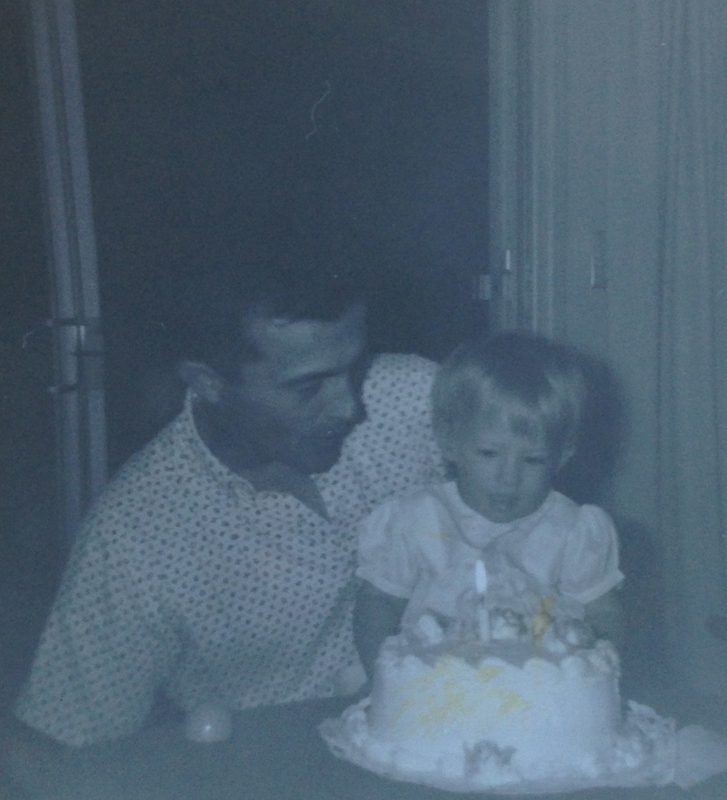 Daddy and me on my first birthday, 1962. What a gift. It’s a gift I’ll carry my whole life long, and, I expect, into eternity. Thank you, Daddy.